The QoS is performed by means of dropping packets. In case of TCP protocol, the dropped packets will be resent so there is no need to worry that with shaping we lose some TCP information. Before sending data over an interface, it is processed with a queuing discipline. By default, queuing disciplines are set under /queue interface for each physical interface (there is no default queuing discipline for virtual interfaces). Once we add a queue (in /queue tree) to a physical interface, the interface default queue, defined in /queue interface, for that particular interface gets ignored. It means - when a packet does not match any filter, it is sent through the interface with the highest priority. HTB (Hierarchical Token Bucket) is a classful queuing discipline that is useful for applying different handling for different kinds of traffic. Generally, we can set only one queue for an interface, but in RouterOS queues are attached to the main Hierarchical Token Bucket (HTB) and thus have some properties derived from that parent queue. For example, we can set a maximum data rate for a workgroup and then distribute that amount of traffic between the members of that workgroup. green - a class the actual rate of which is equal or less than limit-at. At this state, the class is attached to self slot at the corresponding priority at its level, and is allowed to satisfy its limit-at limitation regardless of what limitations its parents have. For example, if we have a leaf class with limit-at=512000 and its parent has max-limit=limit-at=128000, the class will get its 512kbps! As you can see from the picture, leaf-classes which are at the green state, will always have a higher priority than those which are borrowing because their priority is at a lower level (level0). 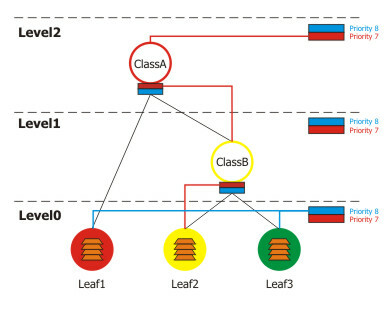 In this picture, Leaf1 will be served only after Leaf2, although it has a higher priority (7) than Leaf1 (8). 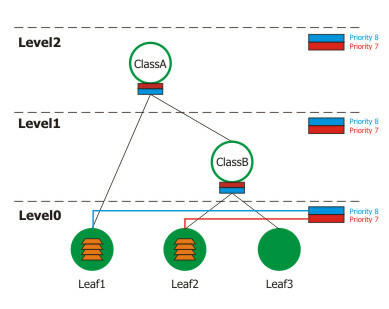 Imagine a situation when there have packets arrived at Leaf1 and Leaf2. Because of this, Leaf1 attaches itself to this level's (Level 0) self slot with priority=8 and Leaf2 attaches to self slot with priority=7. Leaf3 has nothing to send, so it does nothing. 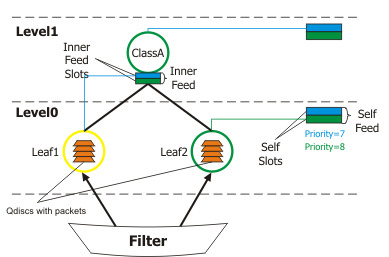 This is a simple situation: there are active classes (Leaf1 and Leaf2) at Level 0, and as they both are in green state, they are processed in order of their priorities - at first, we serve Leaf2, then Leaf1. Now assume that Leaf2 has to send more than 256kbps, for this reason, it attaches itself to its parent's (ClassB) inner feed, which recursively attaches itself to Level1 self slot at priority=7. Leaf1 continues to be at green state - it has to send packets, but not faster than 1Mbps. Leaf3 still has nothing to send. This is a very interesting situation because Leaf1 gets a higher priority than Leaf2 (when it is in the green state), although we have configured it for a lower priority (8) than Leaf2. 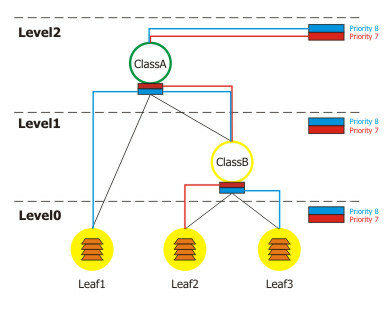 It is because Leaf2 has disconnected itself from self feed at Level 0 and now is borrowing from its parent (ClassB) which has attached to self feed at Level 1. And because of this, the priority of Leaf2 'has traveled to Level1'. Remember that at first, we serve those classes which are at the lowest level with the highest priority, then continuing with the next level, and so on. This scenario shows that Leaf1 has reached its max-limit, and cannot even borrow from its parent (ClassA). Leaf2 has hierarchical reached Level2 and borrows from ClassB which recursively must borrow from ClassA because it has not enough rate available. As Leaf3 has no packets to send, the only one class who sends them, is Leaf2. Assume that Leaf2 is borrowing from ClassB, ClassB from ClassA, but ClassA reaches its max-limit (2Mbps). In this situation Leaf2 is in yellow state, but it cannot borrow (as Class B cannot borrow from Class A). 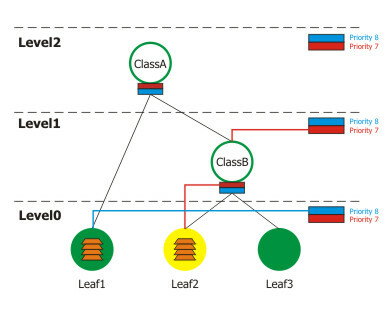 Leaf1 borrows from ClassA, Leaf2 and Leaf3 from ClassB, and ClassB also borrows from ClassA. Now all the priorities have 'moved' to Level2. So Leaf2 is on the highest priority and is served at first. As Leaf1 and Leaf3 are at the same priority (8) on the same level (2), they are served, using the round robin algorithm. Bursts are used to allow higher data rates for a short period of time. Every 1/16 part of the burst-time, the router calculates the average data rate of each class over the last burst-time seconds. 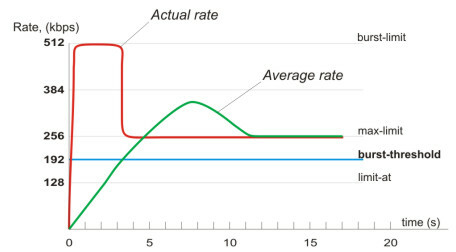 If this average data rate is less than burst-threshold, burst is enabled and the actual data rate reaches burst-limit bps, otherwise the actual data rate falls to max-limit or limit-at. At the beginning the average data rate over the last 8 seconds is 0bps because before applying the queue rule no traffic was passed, using this rule. Since this average data rate is less than burst-threshold (192kbps), burst is allowed. After the first second, the average data rate is (0+0+0+0+0+0+0+512)/8=64kbps, which is under burst-threshold. After the second second, average data rate is (0+0+0+0+0+0+512+512)/8=128kbps. After the third second comes the breakpoint when the average data rate becomes larger than burst-threshold. At this moment burst is disabled and the current data rate falls down to max-limit (256kbps). When adding a simple queue, it creates 3 HTB classes (in global-in, global-total and global-out), but it does not add any classes in interface queue. Queue tree is more flexible - you can add it to any of these HTB's. In this submenu you can create your custom queue types. Afterwards, you will be able to use them in /queue tree, /queue simple or /queue interface. These queuing disciplines are based on the FIFO algorithm (First-In First-Out). The difference between PFIFO and BFIFO is that one is measured in packets and the other one in bytes. There is only one parameter called pfifo-limit (bfifo-limit) which defines how much data a FIFO queue can hold. Every packet that cannot be enqueued (if the queue is full), is dropped. Large queue sizes can increase latency. Stochastic Fairness Queuing (SFQ) cannot limit traffic at all. Its main idea is to equalize traffic flows (TCP sessions or UDP streams) when your link is completely full. The fairness of SFQ is ensured by hashing and round-robin algorithms. Hashing algorithm divides the session traffic over a limited number of subqueues. After sfq-perturb seconds the hashing algorithm changes and divides the session traffic to other subqueues. The round-robin algorithm dequeues pcq-allot bytes from each subqueue in a turn. The whole SFQ queue can contain 128 packets and there are 1024 subqueues available for these packets. To solve some SFQ imperfectness, Per Connection Queuing (PCQ) was created. It is the only classless queuing type that can do limitation. It is an improved version of SFQ without its stohastic nature. PCQ also creates subqueues, regarding the pcq-classifier parameter. Each subqueue has a data rate limit of pcq-rate and size of pcq-limit packets. The total size of a PCQ queue cannot be greater than pcq-total-limit packets. If you classify the packets by src-address then all packets with different source IP addresses will be grouped into different subqueues. Now you can do the limitation or equalization for each subqueue with the pcq-rate parameter. Perhaps, the most significant part is to decide to which interface should we attach this queue. If we will attach it to the Local interface, all traffic from the Public interface will be grouped by src-address (probably it's not what we want), but if we attach it to the Public interface, all traffic from our clients will be grouped by src-address - so we can easily limit or equalize upload for clients. To equalize rate among subqueues, classified by the pcq-classifier, set the pcq-rate to 0! PCQ can be used to dynamically equalize or shape traffic for multiple users, using little administration. Random Early Detection is a queuing mechanism which tries to avoid network congestion by controlling the average queue size. When the average queue size reaches red-min-threshold, RED randomly chooses which arriving packet to drop. The probability how many packets will be dropped increases when the average queue size becomes larger. If the average queue size reaches red-max-threshold, the packets are dropped. However, there may be cases when the real queue size (not average) is much greater than red-max-threshold, then all packets which exceed red-limit are dropped. Mainly, RED is used on congested links with high data rates. Works well with TCP protocol, but not so well with UDP. Note that if other queues are applied for a particular packet, then these settings are not used! packet-marks (name; default: "") - packet mark to match from /ip firewall mangle. More packet marks are separated by a comma (","). 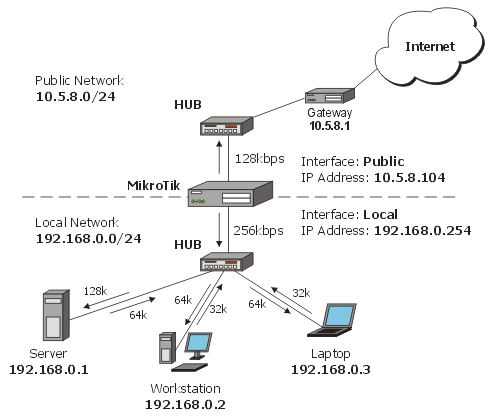 This example shows how to equally share 10Mibps download and 2Mibps upload among active users in the network 192.168.0.0/24. 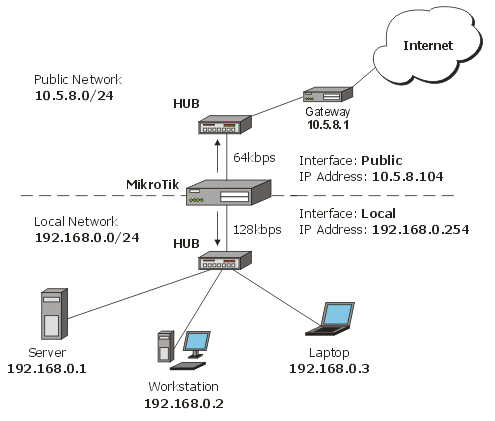 If Host A is downloading 2 Mibps, Host B gets 8 Mibps and vice versa. 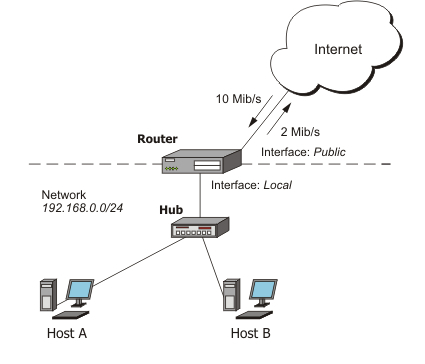 There might be situations when both hosts want to use maximum bandwidth (10 Mibps), then they will receive 5 Mibps each, the same goes for upload. This setup is also valid for more than 2 users.